Nothing says time to clean out the closet clutter like spring. We’ve been spring cleaning around our house, more like spring purging, and the bags and boxes have been piling up as we sort everything into our keep / toss / garage sale / donate piles. I have a huge laundry stack of to be washed and then donated clothes waiting for me to tackle it. I always wash everything before donating it. Hubby thinks I’m a bit crazy. He always says “You are giving this stuff away, why are you washing it?” But I would be mortified to donate something that was dirty or stained. Even if something is stained I like to give it one more chance before going in the toss it pile. And that’s where Tide comes in. Today in the mail I got this ridiculously cute 6 pack of mini-Tide bottles. This #PGmom delivery was just the inspiration I needed to help tackle my wash then donate pile. Though my standard favourite is the Coldwater Clean version, I’m thinking the new Tide Plus Ultra Stain Release should be just the thing to get my clothes extra sparkling give-me-away clean. 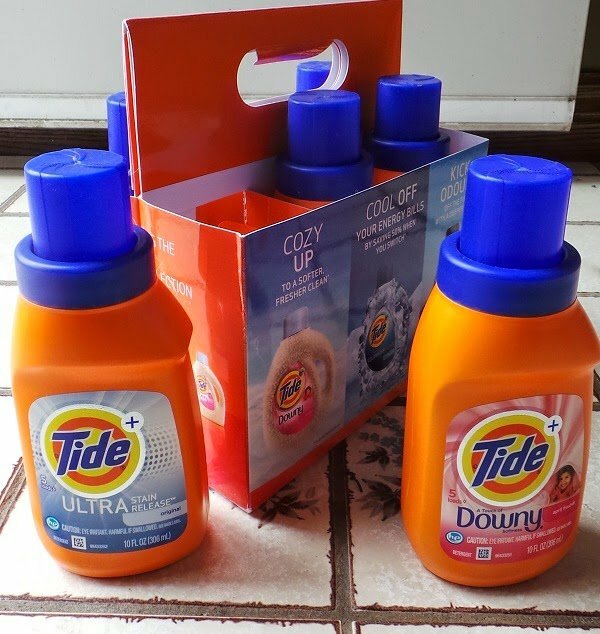 My four year old laundry assistant’s vote goes to the Tide Plus with a Touch of Downy. I thought she was just picking it because of the pink bottle but she says she likes it because it smells like spring. 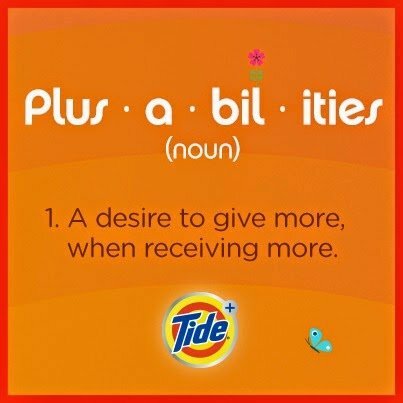 Tide is teaming up with the Goodwill to commemorate the launch of it’s new laundry detergent collection. They want to encourage Canadians to embrace the Plusabilities and fling out the old and bring in the new! A Tide truck will be visiting prominent family attractions in Toronto, Vancouver and Montreal picking up gently used clothing donations to celebrate new beginnings with its not for profit partner, Goodwill. * Give someone confidence going to a job interview. * Make a kid smile going to class with a cool pair of kicks. * Enable skills development and employment and work experience for those who face employment barriers. * Support community-based programs through the funds raised as Goodwill donates 82 per cent of its revenue back. And there’s something in it for you too. When you drop off a clothing donation at a Tide Truck you’ll receive a Tide Plus coupon booklet as a thank you. For those of you who live close to where the Tide Truck will be visiting, I hope you’ll take a moment to drop off some items and perhaps even treat yourselves by taking your families to visit the attractions where the drop off points are being hosted. * visit the Tide website. * connect with Tide on Facebook. 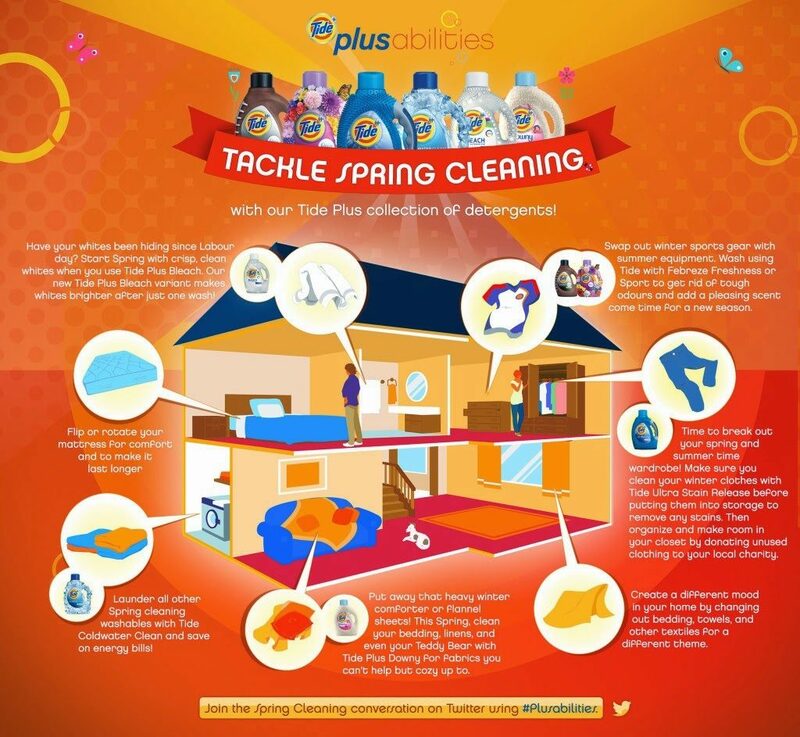 Head over to smartsource.ca to get a Print & Use Coupon for $1 off your next Tide Plus purchase.